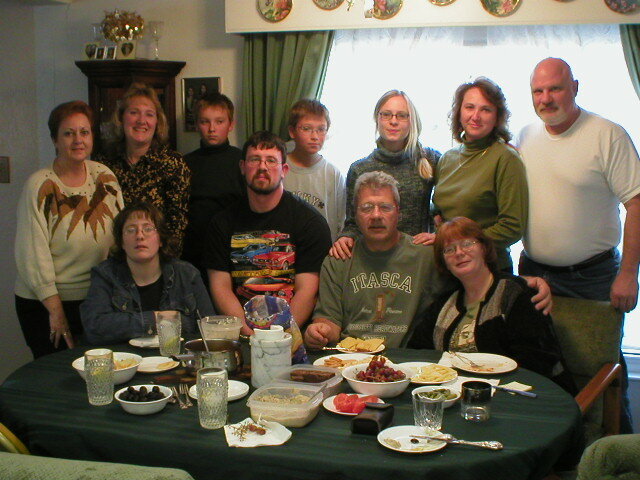 Article on Windom (Calling Dances upon Booking...Contact 307-322-3433) Serving people for many years. Now 30 years (2011) at WHS, and the dancers are awesome, and get through the 50 mainstream movements. Thank God for all the beautiful young people. 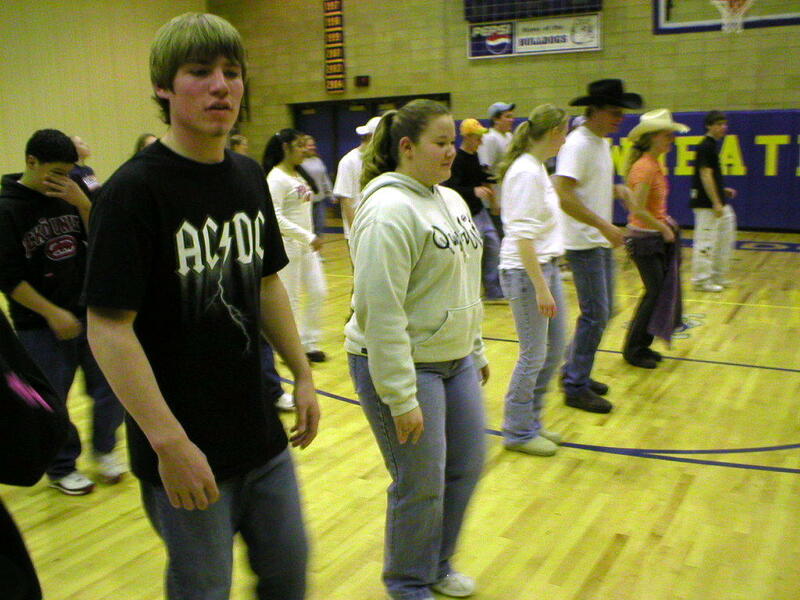 For 25 years, Wheatland’s high school gymnasium has been transformed into a school-wide square dance every Thanksgiving week. WHEATLAND – Denim minis don’t flutter like a full skirt. They don’t twirl, and they certainly don’t rustle. But they’re good enough for this square dance. Jarvis Windom steps up on a wooden blue platform. “I’m known as the do-si-do man,” he says. His record equipment is strewn across the plastic Rubbermaid table. His whit Panama Jack hat sits brim up, turning “JARVIS WINDOM” written in black permanent marker upside down next to his silver iPod. The iPod is his traveling equipment. The rest stays at home when he calls dances on the road. “Get your square dance partners out here, and let’s get this going,” he tells the students. 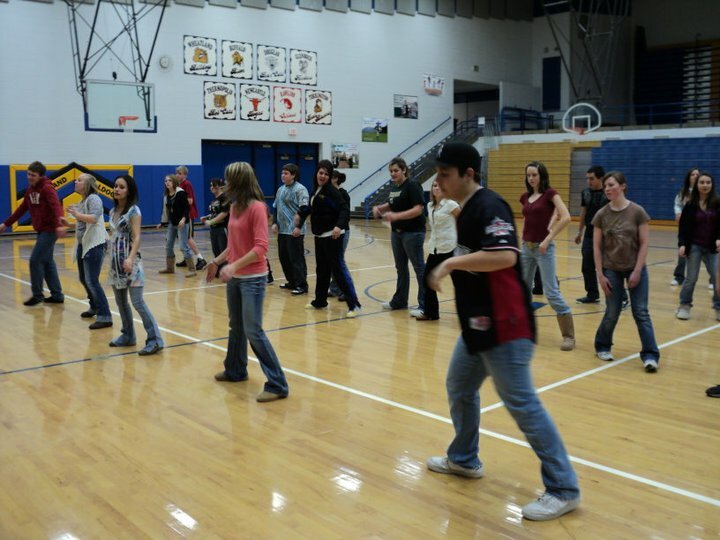 For the past 25 years, the gymnasium at Wheatland High School has been transformed into a school-wide, three day square dance during Thanksgiving week. Every year the cool kids, science geeks, jocks, cowboys and rednecks all shed their clique and join the ranks of the “gents” and “purty little ladies.” It’s “Oklahoma!” in jeans and flip-flops. But these students are not just messing around. They’re actually pretty good. Windom starts the music, a twangy, non-descript piece that melds with his voice. Windom doesn’t boom over the music, he becomes part of it, a banjo in a bluegrass band. The students form their squares, bow to their partners and begin to move with Windom’s calls. Like an auctioneer on a roller coaster, Windom winds them up and brings them down. He crescendos into the hard moves and decrescendos as he keeps time. “Left, right, left, right, he says quietly as the students pull each other through a weaving move. His voice begins to rise, matching the beat of the music. “Right and left and meet your lady.” One and two and three and four. He stands at the front of the room, heels together, toes pointed out. His voice lifts in a crescendo, keeping with the beat: one and two and three and four and……… “Star through and guess who!” Windom says with a dip in the knees. “Whoooooo!” the girls yell as they meet up with their original partner. Barb Schutt, physical education and activity director, says the activity meets all three standards set out for P.E. : movement, fitness, and personal and social behavior. “I look at all the problems that we see (and think) there’s no way they would like to square dance,” Schutt says. 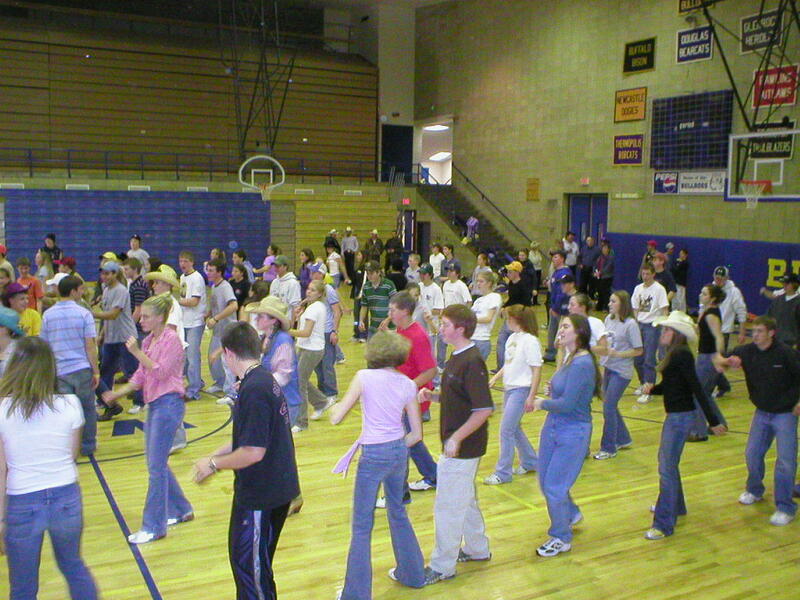 “And they beg.” The square dance has been a part of the P.E. curriculum for more than two decades. Sydney Montoya, a senior at Wheatland High School, says students count down the days before the square dance. 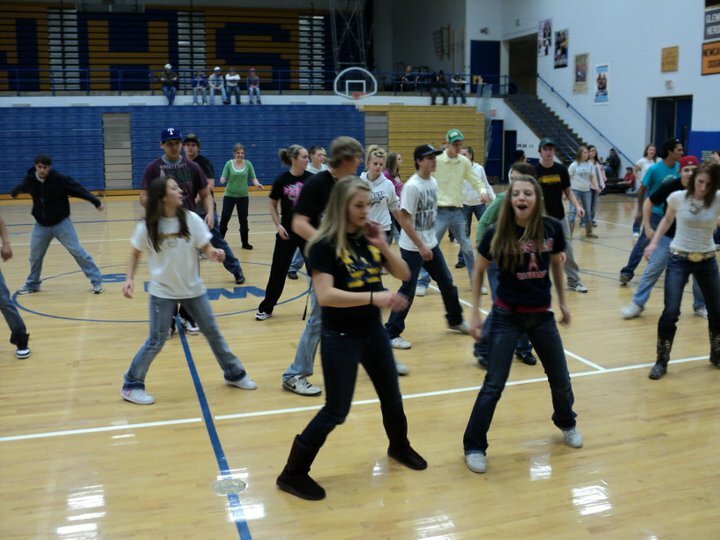 She and the other girls in her square – Rachael Frake, Ashley Berg and Lindsey Balzan – all agree it’s the “cool thing to do.” They say more people participate during the square dance than at school dances. Schutt says square dancing teaches them more than just dance moves. “I’ve seen more kids that know what they’re doing helping kids that don’t. To me that’s what life is all about,” she says. This will be Windom’s 40th year calling dances. “I danced the parents, now I dance their kids,” Windom says. “At the end of three days, these kids can go with any square dancing group in the world and dance.” After a break, the students are ready for the last dance of the season.